George Osbourne delivered his first budget flanked by Liberal Democrats Nick Clegg and Danny Alexander on either side, and clearing the uncertainty of the past 6 months which allows business's and individuals to make long-term decisions. The primary objective of the emergency budget is to address the unsustainable £156 billion annual budget deficit that risks bankrupting Britain, in this respect the budget appears to have succeeded in projecting that over the term of the parliament this deficit will be reduced to £20 billion per year. In total the budget took £40 billion out of the economy or 3% of GDP by means of £8 billion of net tax rises and £32 billion of spending cuts. VAT will rise from 17.5% to 20% effective from 4th of Jan 2011, I had forecast for it to come in on the 1st of Jan 2011. VAT will raise approx £13 billion. The VAT hike will result in an inflation spike as I have been warning off for the past few months (George Osbourne's Wage Inflation Price Spiral VAT Increase ). Now it is clear that the VAT inflation spike will start in January 2011 inflation data. 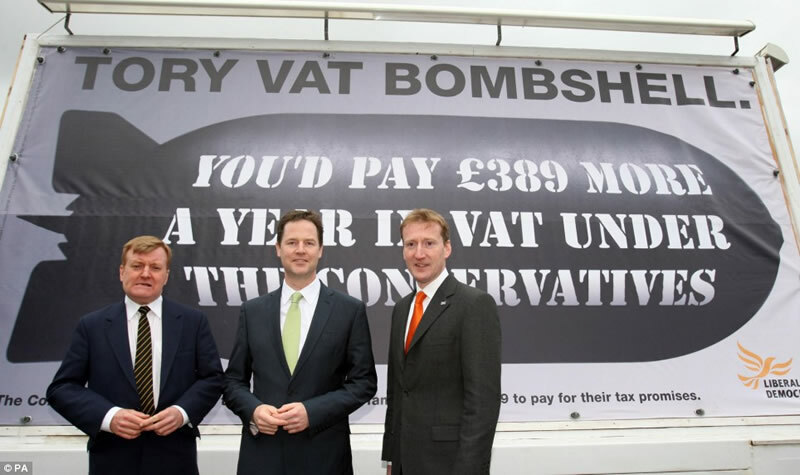 It was only a couple of months ago that the Lib Dem Leader and Coalition partner Nick Clegg was warning of the Tory VAT bombshell. The Government intends to target 25% of spending cuts across non ring fenced spending departments to culminate in an annual spending cut of £32 billion. However spending cuts of 25% are just not possible in my opinion, 15% is achievable but 25% ? This means that there exits an approx £13 billion annual hole in the governments plans or about £50 billion over the 4 years from 1st April 2011, which means higher borrowing and deficits than forecast, which implies that there could be further tax rises in future budgets. At least 500,000 public sector jobs will go and possibly as many as 700,000, the problem here is the culture and ethos of public sector workers means that most are unemployable in the far more flexible private sector unless they change their mindset. Public sector salaries of above £21,000 per annum will be frozen for the next 2 years, originally it had been assumed that pay from £18k would be frozen. Whilst the press focuses on the public sector net debt of £850 billion, however the bigger elephant in the room is the Public Sector gold plated pensions liability of more than £1 trillion that already requires tax payers to fill the gap of near £10 billion per year of that between contributions and benefits that is destined to continue mushrooming ever higher that ultimately risks bankrupting Britain. The bottom line is that the public sector workers contribute 50% less than the pensions provisions made availabel to them, the gap being left for future tax payers to fill. The chancellor announced that John Hutton would provide an interim report on the public sector pensions crisis by September 2010. The new government is using a slight of hand to to switch from the higher RPI inflation index (5.3%) to the lower CPI inflation index (3.4%) in across the board indexation of spending commitments, tax and benefit measures to save an approx £6 billion per year. However this is just another effect of masking the real rate of inflation from the public which the RPI at 5.3% more accurately reflects. CGT will rise for higher rate payers from 18% to 28%, and remain at 18% for basic rate tax payers. There were fears of CGT rising to 40% or 50%, which would hit long-term investment as well as reduce market transactions and hence reduce tax revenues. Corporation tax will be cut by 1% per year for the next 4 years from 28% to 24%. Small companies will see their tax rate cut from 22% to 20%. The negative is that capital allowances are being cut from £100k to £25k. The bank levy will raise £2 billion per year. The banks have been hit less than expected as a tax of £5 billion had been anticipated. The Tax credits payments ceiling will be cut from families with earnings of £50,000 to £40,000, which will put families in this bracket at least £520 per year worse off. The state pension will now rise in line with earnings or inflation, which ever is higher, or by a minimum of 2.5% per annum. Housing benefit is one of the most abused benefits of the welfare system that effectively allows people to choose not to work and live off the state in perpetuity, a cap at £400 per week still means that this single benefit can reward those that choose not to work to the tune of £20,800 a year towards housing costs which is more than the average gross salary of most of the people outside of London. The Government should have gone much further in lowering the maximum amount of Housing Benefit to reduce the amount of fraud that takes place that runs in the several billions each year. Child benefit will be frozen at current levels for the next 3 years. There had been fears of mean testing. A number of Labour government reports over the years had concluded that as many as 1/3rd of Disability Claimants are fraudulent, though Labour never did anything about this. The new government is to implement medical assessment from 2013 to address this mega-fraud. The income tax allowance has been raised by £1,000 to £7,475 to take some 800,000 people out of the tax system and as part of the objective to work towards the Lib Dem goal of a £10,000 annual tax free allowance. has the budget had any effect on the UK already and what is the predicted effects? My next in-depth analysis within the next 2 days will seek to address this Issue.